If true, nodes will be reused. Recalculate nodes in the graph. Nodes might be created, moved or destroyed depending on how the world has changed. Penalty to add to the nodes. A penalty of 1000 is equivalent to the cost of moving 1 world unit. Updates the specified node using this GUO's settings. The bounds to update nodes within. Nodes which were updated by this GraphUpdateObject. Will only be filled if trackChangedNodes is true. 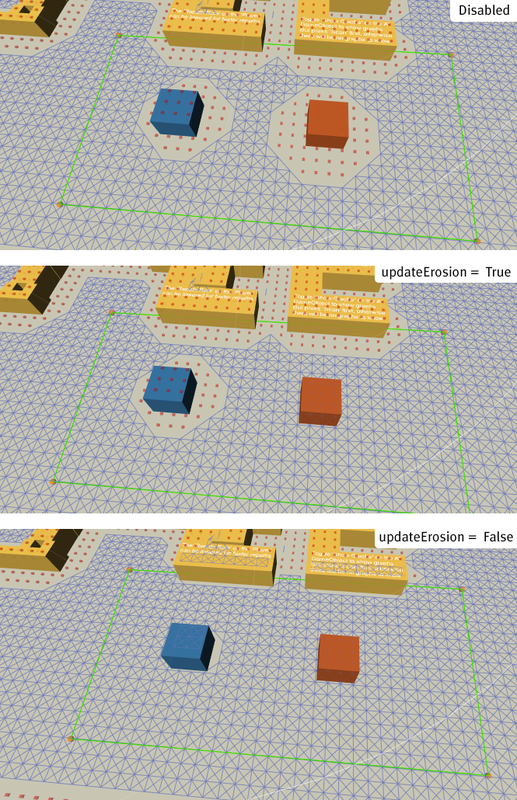 It might take a few frames for graph update objects to be applied. If you need this info immediately, use AstarPath.FlushGraphUpdates. If true, all nodes' tag will be set to setTag. If true, all nodes' walkable variable will be set to setWalkability. The Pathfinding.NNConstraint.SuitableGraph function will be called on the NNConstraint to enable filtering of which graphs to update. As the Pathfinding.NNConstraint.SuitableGraph function is A* Pathfinding Project Pro only, this variable doesn't really affect anything in the free version. Reverts penalties and flags (which includes walkability) on every node which was updated using this GUO. Data for reversion is only saved if trackChangedNodes is true. Not all data is saved. The saved data includes: penalties, walkability, tags, area, position and for grid graphs (not layered) it also includes connection data. This method modifies the graph. So it must be called inside while it is safe to modify the graph, for example inside a work item as shown in the example below. If modifyTag is true, all nodes' tag will be set to this value. If modifyWalkability is true, the nodes' walkable variable will be set to this value. A shape can be specified if a bounds object does not give enough precision. Note that if you set this, you should set the bounds so that it encloses the shape because the bounds will be used as an initial fast check for which nodes that should be updated. Track which nodes are changed and save backup data. Used internally to revert changes if needed. Use physics checks to update nodes. When updating a grid graph and this is true, the nodes' position and walkability will be updated using physics checks with settings from "Collision Testing" and "Height Testing". When updating a PointGraph, setting this to true will make it re-evaluate all connections in the graph which passes through the bounds. This has no effect when updating GridGraphs if modifyWalkability is turned on. On RecastGraphs, having this enabled will trigger a complete recalculation of all tiles intersecting the bounds. This is quite slow (but powerful). If you only want to update e.g penalty on existing nodes, leave it disabled. Should be called on every node which is updated with this GUO before it is updated.